Small development of 5 low-rise chalets (only a few apartments per chalet) well thought-out for great mountain lifestyle (apartments are close to Megève centre) and plenty of green areas to combine with the superb surroundings (great views on Evasion Mont-Blanc ski area). Some of the apartments also offer bedroom views onto the Mont-Blanc. The chalets have also access to a swimming pool and Spa area for their owners to relax after a day on the slopes. The dwellings ranging from the studio ideal as a pied-a-terre to the 5-bedroom trophy property, all ideally oriented, will seduce you with their spacious interiors and extensive covered terraces. These chalet apartments for sale in Megeve are located only 750 metres from the lifts (Rochebrune). The chalet apartments are sold with private parking, a cave for storage and a ski locker. Small development of 6 low-rise chalets (only a few apartments per chalet) well thought-out for great mountain lifestyle (apartments are close to Megève centre) and plenty of green areas to combine with the superb surroundings (great views on Evasion Mont-Blanc ski area). Some of the apartments also offer bedroom views onto the Mont-Blanc. The chalets have also access to a swimming pool and Spa area for their owners to relax after a day on the slopes. They are accessed by several footpath all leading onto a central main square boasting an exclusive artwork to keep with the elitist feel of this real estate project. The apartments are set over 5 detached chalets and delivery will take place Q2 2020 for the first three chalets and last two will be delivered Q4 2020. All the apartments each come with an extensive private terrace to enjoy the views and outdoors and the living surfaces are generous all with modern and high-end finish. Concierge services will be available to the owners like babysitting, sport coaches, events management and catering, taxis, etc. Some of the fixtures: Extra large size wood windows, all interior doors with wooden frames, underfloor heating, fully-equipped kitchen, parquet floors in bedrooms, living room and hallway, Marazzi tiled floor (30×60 or 60×60 depending on apartments), walk-in showers, pric=vate terrace with wooden floor, spacious private garages and ski room, Spa area with jacuzzi/Gym/Hammam/Swimming Pool. 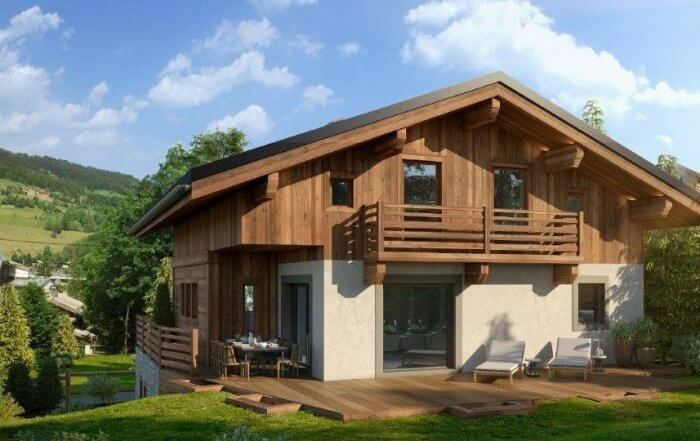 Some of the properties in Megève can be in excess of 20,000 euros per sqm when this brand new luxury development with swimming pool is only 8,450€ per sqm. The best apartments are quickly being reserved at Chalet Stallion in Megève. Testament to the great views, great quality of build, rare spa facilities, all packaged with low prices for Megeve. Rental management including concierge services will be in place for delivery with possibility to claim VAT back for a super low price of 7,000€ average. Prices from €359,000, apartments range from 1 to 5 bedrooms in 6 chalets – some are duplexes and triplexes penthouses (big units 3-5 bed including a chalet) Apartments are sold with parking, cave for storage and ski locker. Situated only 5 minutes walk from the more than 200 shops and top restaurants/bars that make up Megève exclusive centre. Less than 750 metres from Rochebrune lifts & the pistes. Also available ski shuttle stop next to residence to take you to the lifts. Concierge service & wellness area with pool, fitness room & spa. Megève (and Courchevel) offers the best dining experience in French Alps and has always been the French Jet Set destination of choice with one of the shortest transfers from Geneva airport under an hour. Megève was one of the first ski resorts to be created in the French Alps. Today it is a unique place with an enormously historic and effervescent alpine atmosphere reminiscent of the old alpine way of life. Its history, atmosphere and culture attract an international audience and its skiing is also first class, with snow lovers enjoying access to one of the world’s largest lift-linked ski areas. Equally significant, its range of shopping, restaurants, facilities and organised activities available surpasses all other French Alpine resorts. Megève’s ski area (Evasion Mont Blanc properties for sale) boasts 300 kilometres of marked trails. These are served by 81 integrated lifts (and no t-bars) offering extensive terrain for skiers and snowboarders of all levels.